I recently got my Google Wave invite* (thanks to Jure) and I wanted to share some of my initial impressions. As most of you probably know already, Google Wave is an online real-time collaboration and communication tool, which combines elements of e-mail, instant messaging, social networks and wikis (watch the overview video for more info). It was first announced in May, with a big promise of reinventing e-mail for the 21st century. It has been in private beta for some time now, and it’s been getting mixed reviews with many people marking it as overhyped. So I was really curious to try it out on my own and see if it can live up to its (big) expectations. I’ve now been using Google Wave for about a week with various existing and new contacts. Currently, one big limitation is that you don’t get any invites when you start using the service, so your pool of contacts is initially quite limited and therefore you probably won’t be able to immediately use the tools in that many real-life situations. Overall, I still believe this tool has a lot of potential to replace many collaboration tools (don’t think it will replace e-mail in the near future though), but it still needs some important features before if can go really public. 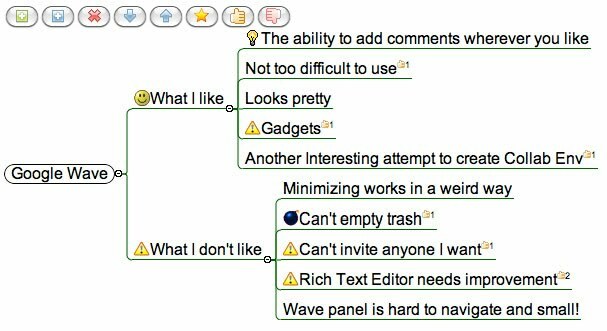 you can get a lot of additional functionality with Wave extensions like the Mind Map gadget shown below. So, Google Wave provides a lot of great functions, but it lacks many privacy/permissions settings, plus a lot of features are still too difficult to use. A lot of users also complain that it can also be quite slow (especially if you add a lot of extensions in a long wave). But let’s not forget that Wave is still in beta, so I hope that some of the main annoyances get fixed before it opens up to the public. I browsed through Product Ideas for Google Wave today, and I think most users agree on the basic improvements that Wave needs. Even though my list of missing features isn’t short, I’m still a Google Wave believer and can’t wait to try it out in the real world. For example, I really like the idea of using Google Wave at conferences and in classrooms or the ability to use Google Wave widgets in Moodle courses (I’m also looking forward to an activity module for embedding whole waves into Moodle). If you’re just getting started with Google Wave and still feeling a bit lost, I suggest you check out the 5 minutes overview of 15 key Google Wave features and Mashable’s Google Wave Complete Guide. 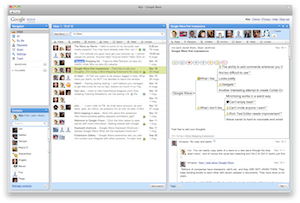 If you’re on a Mac, you can also try out Waveboard, a desktop app for Google Wave. Personally, I keep Waveboard always open, so I can see when new waves or changes are made. And there is also Waver, an Adobe AIR Wave client, which works on all operating systems. * Sorry, don’t have any invites to send out yet, will tweet when I do.